I’ve noticed an increase in interest around the topic of tiny house business opportunities. Things seemed to get jump started sometime after July 17, 2010 when Jay Shafer’s story was featured on the Yahoo homepage. The media seemed to really like the idea that tiny houses were thriving while McMansions continued to suffer. Variations on that theme were retold by many mainstream media channels for months following that initial story. From what I hear from the larger community tiny house businesses are doing well, but not in the areas you might expect. The order of this list is based on my general impressions of our micro-segment. Books – Books seem to be the biggest money maker. Plans – House plans help folks visualize how to build a house. Free information – Blogs, and social media in general, is a wonderful way to help people connect and build communities. Blogs are commonly monetized through advertising and revenue increases with popularity. Workshops – Hands-on workshops are a great way to get a crash course in building and design. Finished Homes – Professionally finished turn-key homes. I imagine the journalists reporting that tiny houses were growing in popularity compared to McMansions were assuming that tiny house sales were booming, but I don’t think that’s true. The sales of physical tiny houses actually seems to be soft compared to the sales of how-to information. This makes perfect sense to me because tiny houses perfectly illustrate how living with less can buy back some of the freedoms lost by living in debt. So they naturally attract large numbers of hopeful do-it-yourselfers and people looking for a better way to live. I suspect there are several business niches that have not been fully explored yet. Here are some ideas that may have potential. How to DVDs – I’ve not seen any high quality tiny house construction DVDs, and I suspect this would be a very popular item. Empty Shells – Imagine an empty tiny house with a ‘closet’ at one end; a closet big enough to be turned into a small bathroom. This simple shell could function as a home office/studio or be converted into a living space. Empty shells might appeal to do-it-yourselfers as well as those needing an extra room. Rentals – This might be a bit tricky legally speaking… but it might be a shoe-in for campground owners looking to expand their offerings. Cottage Industry – Some small businesses might find a tiny house an ideal place to do business. It’s hard to say where tiny houses will go in the next few years; after all nobody can predict the future. But we all notice trends and can learn lessons from observing the results of cause and effect – so I’ll take a stab at peering into the future. The future of abundant energy supplies seems to be the question on everyone’s mind – even if they’re not talking about it yet. I suspect this is due to the the uncertainty we all feel about the topic. But I think there are some things we can be certain about. If we do begin to run out of gas we’re going to need to learn to live differently and our homes will need to change. So from a business perspective I’d have to assume that anything that empowers people to live more sustainably will have a real future. How the economics will all work out in the end is anyone’s guess; but things that provide true value, like food and shelter, will continue to be in demand. Things with market-determined values will continue to be a gamble. 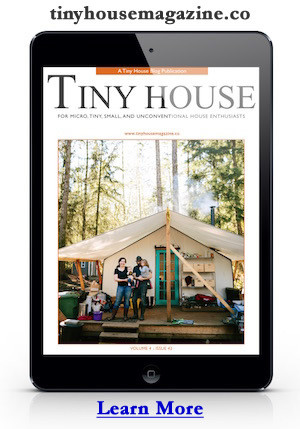 This entry was posted in Tiny Living and tagged blogging, books, business, Plans, tiny house, Workshops. I know I am nearly as guilty of it as anyone, but we need to stop ignoring the elephant in the room: I would bet that 90% or more of people that want to take advantage of tinyhouses, cannot, because of zoning or analogous problems. People are continually discovering the idea of tinyhouses, but I think 90% of them give up on it and just wander off when they find out the legal barriers. We need to stop ignoring this. This. A thousand times this. I want to set one up but I can’t in my city. I agree with both of you. the big problem with home building and zoning issues everywhere is that building codes etc…. that make up what is legal and not for homes from one city to the next is that we’re still using the same stupid house building and zoning codes that was made back in the 40s or 50s. with this crappy economy and the high cost for buying and living in homes based off those stupid old zoning and home building codes and how stupid are government has gotten we need to change those stupid building and zoning codes. Support systems. On my blog I posted the “tiny system” draft design, a draft of a system design that provides clean water, space heating, hot water, laundry, electricity, ventilation, refrigeration, cooking, a toilet solution, for full time use, for an estimated ~$4000 in parts. But you’d have to build it yourself, and it is not portable, and it takes up quite a bit of land area. There is a lot of opportunity for this sort of thing – for electricity alone, there is a ton of potential, which I explain in my post “talked to sunpower today about those engines” for a mini cogen unit suitable for small homes. There is nothing available on the market right now, I have checked. The closest thing is the whispergen, which is $6000, is too big, and they will not sell it to you unless you are in one of a few european countries. I do like this article DVD sounds like a very good idea. Tiny houses do work for a rental in a vacation rental setting. We have been renting a 8′ X 16′ tiny house as a weekly vacation rental for the past year on Lake Champlain, NY. We also rent a 330 sq ft 1 Bedroom and a 370 square foot 2 Bedroom on the same property. I know I wouldn’t mind someone building my house for me even though it would cost more but I want it just how I want it and I am not sure who could build it that way. Also, although some people have put their tiny homes on the market, I don’t know if they have sold. The ones I have seen don’t have what I want in them so I won’t buy one. The thing with tiny homes is there is no room for what you don’t want so they almost need to be made with each unique person in mind and that’s not easy to do. The zoning issue is my biggest stumbling block so far. I think a huge hurdle to seeing more growth in terms of folks purchasing such houses is the difficulty in finding places to put them. I wonder if there might be a market for unique designs for tiny houses. I know if I had something totally nontraditional, I’d be hesitant to go to a real architect (plus I’d not want to pay that high a fee for such a small project). I love this article, kudos to the writer. I live in the U.K. and would love a tiny house but land is very expensive. The only feasible way of making this work that I can think of is to rent land from a farmer or such-like. Even better, a tiny home community who all club together to buy an acre of land 🙂 There MUST be a way to make this work. The current way of living is just so unnatural. Work, work, work to pay of mortgage or rent. Yuck. Life is too short and precious. Give me a tiny house with a few trees around me and the big sky above me. Let me have enough time on this earth to marvel at the stars above my head instead of being worried about the bills at my feet. Zoning laws are a major hurdle in many areas but are changing toward smaller housing in some areas. Vancouver, BC, Canada has recently moved to allow “Laneway” housing. While still large by the tiny house standards on your site this is a start. I could see the tiny mobile house working in existing mobile home or recreational lots or rural areas. Cities are the challenge for a housing model that effectively still occupies a given land space. Most cities want to preserve a certain tax base and hence value of built homes and that is why changing zoning is such a challenge. A while back I wrote up some ideas on how and where to build/place tiny houses. Just food for thought. Yes, but Michael, if you were actually actively looking at living in a tinyhouse full time, you would see things very differently. Moving out into the styx is not an option for 95% of people. Buying multimillion dollar multi-family zoned plots is likewise totally impractical for 99%. Hiding in plain site and seeking a variance (actually it would have to be an amendment, a variance is different, and only applies to irregular properties and minor exceptions) are the only practical options, and are still major problems. I know you only said it is food for thought, but we don’t need increasingly impractical, unreliable, convoluted, and expensive schemes. It also doesn’t make any sense to only have one or two posts about it, treating them like encyclopedia entries. That sort of thing cannot even approach a practical solution to the problem. This problem extends to all corners of the tiny house universe – has to look nice enough, or the neighbors complain, the construction of them are heavily influenced, where the water and electricty are coming from, the need to put them on a trailer, all those things. Also, no one person or small group of people can solve this problem. What we need is to be able to simply be able to put a tinyhouse on whatever land is suitable for them, so long as it is with permission of the owner. Reasonable things like accommodating the desires of the neighbors with respect to not blocking views etc. is totally fine . The bottom line is that the laws are extremely stacked against tinyhouses right now. We need a rule change, period. I see the future of the tiny house movement as one where people who are interested in being a business that provides them and people interested in that model for living become the lobbyists that promote the changes needed in zoning in their local communities. You might hope for that, but unfortunately just look at the prefab industry. It is a fairly big, therefore powerful industry, and it is unable to overcome the zoning barriers which ban prefab buildings in almost all areas in the city. By the way it also has major established practical advantages; the same quality house can be built for 30% less usually. Yet the government still blocks it. Looks like another business could be providing a ‘tiny house park’. Not crammed all cheek by jowl like the usual trailer park, but nicely separated little spots to keep a tiny home. I wonder if it might be easier to get legal permission to do something like that using regulations similar to trailer parks, at least for the mobile tiny homes. If there were a network of them across the country people could stay here, there or wherever as required, keep up on available spaces, maybe have an association that could negotiate insurance as a group rather than individuals. Perhaps part of the park could be rentals for those wanting to try out tiny house living. It could possibly be run as a co-op group rather than one person or company. Since a tiny home park would likely be away from major population centres due to land costs you could also have a van or something to run people to the nearest reasonable public transit or grocery shopping or whatever on some regular schedule to help reduce the carbon footprint from using several private vehicles or enable those without vehicles to participate. The tiny house park/village could also have various workshop spaces included in the rental options like carpentry, pottery, sewing, canning/food preservation whatever, so more people can share tools and equipment rather than own it individually. Alice: I love your vision. As for the van, my city has a car co-op, which would fit in perfectly with the model you described. Further, other than the occasional move, most tiny house dwellers would have no use for a full-sized truck and wouldn’t want the costs of keeping it on the road. But having access to a 1 ton truck via the co-op would be great for moving tiny houses or supply runs, etc. Besides adding sustainability and food security, most of the above can also be used to generate income. Of course none of these ideas are new – just that no one has yet developed a village like this with tiny houses that I’m aware of. There’s a guy trying to start something he calls Eco Trailer Parks http://plusplus.ca/2010/06/the-eco-trailer-park/ but I think he has more of a high end profit oriented thing in mind. What I picture makes more sense as a type of co-op. All the sustainable resources you mention make total sense. There are eco-villages out there already, why not a tiny house eco-village? If you can use market gardening and other home businesses as income generators you wouldn’t need to commute to a nearby town or city other than to market your wares, which can be weekly instead of daily and taken in turns. Unfortunately the people most likely to implement and benefit from it are the ones least likely to have the money to make it happen. We have car co-ops here too, some new apartment buildings have them stationed there as an amenity. But the land costs are not nigher for a tinyhouse than for a regular house. In fact they are a heck of a lot smaller. Why, then would you need to locate tinyhouses in an area with low land prices? I mean if you wanted big lots sure, but that is not inherently tied to tinyhouses. You can buy whatever lot you can afford but are unlikely to be allowed to build a tiny house in a major urban area since they’re moving towards more densification not less, with some justification. Higher populations can only be kept from producing out of control urban sprawl with higher density. Many tiny house people can barely afford to build a house, let alone pay high lot prices and land taxes. An ‘affordable’ urban lot is usually already subdivided into the smallest allowable unit so you couldn’t just buy enough space to tuck your tiny house on. Smaller, cheaper areas are more likely to be flexible in their rules and regulations, especially if they’re scrambling to broaden their tax base as more and more people move to urban areas. Blighted urban areas might be a possibility, but would require major effort and no guarantee of a comfy life for some time to come. See, the difference between what I am thinking and what you are thinking is that you are thinking about rules like that as set in stone. Me, I prefer to start from reality. There are a lot of areas in cities that are perfectly suited to put a tinyhouse on, very inexpensively. Just take a walk around and I sure you sill see a few. Unused backyards are one example. Anyone who rents rooms in their house is fairly likely to consider renting their backyard, too, for example. Yes, there are political problems to overcome before using these spaces becomes practical. But they are soluble. It’s not like it is impractical from a technological standpoint. Secondly, as in infill solution (googeable term) tinyhouses actually greatly increase, not decrease density. Lastly, IIRC, large population growth is not expected in developed countries. The global population is expected to level off at 9 billion, and is 6 billion now, and most of that growth is in developing countries. Alice I love your ideas also, and have been pondering these same kinds of things. I’ve been thinking that the ideal towns are around 5000 people, so finding land just outside of this kind of town center is doable. I’m currently looking at towns in the far northeast. Thanks for your energetic visioning Alice! I’m not surprised based on what I’ve seen online that the real industry right now is in the books and plans. I think a lot of people do arrive at the “where am I going to put it” question because so many zoning laws are against it. I hope some sort of Tiny House communities begin to spring up. I think there could be some traction then. I’m not sure the answer is away from population centers, though. As gas goes up and up, even carpooling is going to stop looking attractive. Somewhere in all this, there needs to be a comprehensive look at land-use laws and mass transit. Everyone wanting to live out in the country on large lots is what got us sprawling subdivisions. The problem with major population centres is that the value of the land and population growth is going to make more density the way of the future almost anywhere in close commuting distance. Multiple unit tiny housing will do well but individual tiny and small houses no matter how little land they occupy are never going to provide that density. Existing trailer parks are being bought up and converted to townhouses and apartment buildings. It is possible to find ‘cheap’ urban land in some areas that have been devastated by current economics (Detroit being one such place) but there may not be enough economic activity to sustain a community and there may be safety and security issues. Places like that are the most likely to be open to zoning changes that bring areas to life again. Perhaps we need some hardy new urban pioneers? Just another though about urban development, there may be some possibilities in transfer of density credits, where a city allows some low density area if a very high density area is created on the same land or elsewhere so that overall density is maintained. It may be possible to develop high density tiny apartment buildings grouped in such a way that it allows a section for individual tiny houses, community gardens, farmers markets, etc. Unlikely but not impossible. In my area which is a wealthy county in the mid-atlantic region, accessory dwelling units are allowed only on lots 10 acres or larger, and there are strict limitations on who can live there and for how long, and very difficult to get approved. Unfortunately, there are very few parcels this large here and the land is VERY expensive. The only affordable housing available is that which developers are required to provide as a percentage in conjunction with a rezoning application, and they are still not very affordable and difficult to get into. Obviously, the county’s concern is preventing trailers, shacks, unsightly or “poor” neighborhoods. Exterior architecture is important. Additionally, existing national building codes are just not applicable to the tiny house. There needs to be a uniform building code for tiny houses which eliminates requirements related to space planning. As a (former) land planner, I know how difficult and time consuming it is to effect any zoning law changes, however I believe NOW is the time for aggressive campaigning to make it possible for the tiny house to become legal and affordable, and the “green” angle is probably the only the way to get there. I believe there needs to be a large coordinated nationwide effort in order to have the tiny house movement taken seriously as a housing option. Since the recession, I have not worked as a land planner and am now a kitchen designer. For the past two years I have become very interested in having a tiny house for myself when my youngest finishes high school. I can find absolutely no interest in the tiny house in this area, so moving away is likely. I have not come across any group that is working to change zoning laws to allow the tiny house as an allowable housing option. Can anyone direct me to a group working on changing zoning laws for the tiny house? I would like to get involved. If you had left an email address….. There is the small house society, but they have not been doing very effective work as far as I can tell. I posted on my blog towardsabettertinyhouse.wordpress.com recently a post in which I mention that it seems like all effective movements have at least a small core of motivated organizers, then it can grow. Right now there does not seem to be any for tinyhouses, unfortunately. The business that make tinyhouses are IMO the people who would most suitably step into this role, although there might be retirees etc. who could do it too. One “loophole” to local codes are the membership private campgrounds. Looking at the older ones around most of the sites are occupied by variations of tiny houses–many over time were converted from travel trailers, but their present appearance is of charming cottages which can no longer be moved. I suppose the foundations are the loophole in some way–not traditional. You would not pay property tax on your cottage but instead the membership dues (what’s the difference). Passing such property on to your heirs is no problem as the companies who own and manage such private campgrounds only care about the membership dues so pay the company as opposed to the tax man. There are a variety of ways in which you can “own” your RV real estate. Many are identical to how you might “own” a single family home. Several reflect the cleverness of the RV park developer working with legal counsel. Reviewed below are common forms of ownership and some of their characteristics, listed in approximate order of popularity. Like a residential condo, the individual owner assumes responsibility for his pro-rata share of the common property and improvements and receives a deed for his legally described “Lot”. Established maintenance fees must be paid or the owned unit will be forfeited. The details of responsibility and limits of ownership are carefully spelled out in the condo documents and should be read carefully and understood. Condos become self governing when most of the Lots are sold. A small condo campground might be run as an all volunteer affair, while large resort style condos are managed day to day by paid staff. Both are ultimately governed by an elected Board of directors. Variations on the basic condo structure include, common ownership of all real estate, whereby what is individually owned is a legal description of a location you may occupy. Another utilizes two deeds, one for the subdivided (technically condo lot) Lot and the second for an undivided interest in all common property. Condominiums differ some depending upon the State in which they are located. Budget handling, maintenance projections and condo reserves can be treated quite differently and receive different levels of governmental oversight depending on the State. There is a trend for State regulations to get more and more into details of condominium operation. Often used to refer to million dollar New York high rise apartments, co-op is also found in campgrounds! Unlike a condo; in a co-op you do not own real estate, but rather a share of stock together with a (proprietary) lease for occupancy. The campgrounds’ real estate is owned by the corporation that issues the stock you own. This collective form of ownership is just like owning stock in GE, except for the added lease which specifies your right to occupy a particular location or “lot” during the time you own the stock. Fee simple means that you have a straight forward deed to a property without ties to any common involvement other than that required by law, taxes, war, etc., for allproperty in the County, Township, Parish, Town or City. You simply own the real estate, or real property, without legal communal entanglement. The use of an RV on fee simple land, not a part of an RV park , will be a matter of compliance with local zoning requirements and “deed restrictions”. Deed restrictions are found in documents recorded by a prior owner that places limits on what can and can not be done with the property. These restrictions will have an expiration date, and usually date from the time the land was last subdivided. “CCRs” and “restricted property” are but two of a variety of terms used to describe recorded property use restrictions. There are other restrictions indirectly effecting your use of property such as easements and mineral rights clauses. Familiarize yourself with the real estate customs and norms in the area where you have interest in owning. The County Courthouse is a good place to start ! What we are only considering here, is a lease that is paid for with a one time fixed payment at the time of execution. From the perspective of a 55 year old retiree, a 99 year lease is forever and so the long term lease is included here. It, of course, is not a form of true ownership but in practice it can be very similar. In this sense the subject real estate lease is like a sale except for the restrictions contained in the lease and the eventual end of the lease at which time the lessee has nothing. It is difficult to generalize about leases. Each one can be structured in a different manner. The UDI is a way to achieve “membership” style camping without the risk of developer flight because the “members” own it ! Each owner ( member) that purchases (joins) receives a deed . The deed represents, for example, a 1:1000 undivided interest in the total campground. The deed is recorded in County Public Records just like any other real estate deed. What is owned is an “Un Divided Interest”, that is, you do not have title to a specific campsite or Lot, but rather, a fractional ownership of the whole park plus a right of use. That use is typically two weeks camping per month and unlimited day use. Facilities can include not only campsites but cabins, boats, horses and other. In our example, the entire park is exclusively owned by 1000 people who each have a deeded interest. Owners (members) pay regular dues or maintenance costs necessary to the parks operation. Not really a form of ownership, still no list would be complete without a consideration of “the back yard”. We’ve all seen RVs camped in the side yard, awning extended and signs of life all around. Just as the “granny” apartment is taking a hold in some locations permitting an addition to a single family home for “granny”, so the RV parked in the yard is accepted in some communities. WOW great info! Thanks Charles. I would like to start a building business for tiny house in tampa florida area. Does anyone know the legal requirements? Do you need a contractor’s license? How much insurance is needed. What type of permitting is required? I have tried to search for this on the web, but there is very little information on the construction side of this.